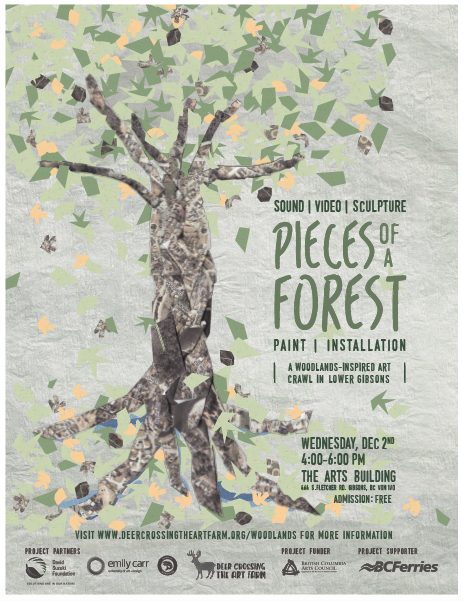 Come explore your forest and town with artists and scientists at the final presentation of the Woodlands Project, a touring exhibit of multi-media installations entitled Pieces of the Forest. 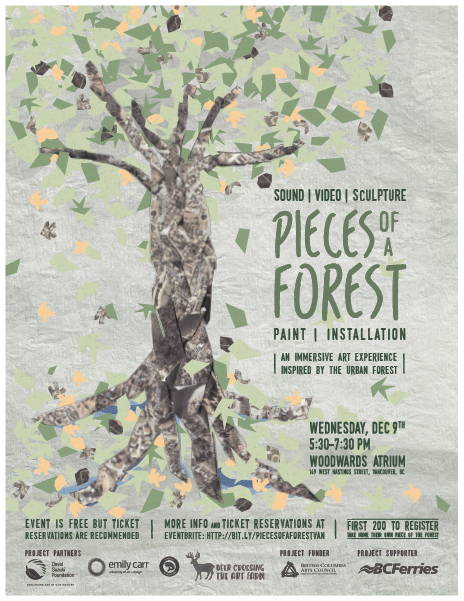 Scroll down to read the story of the woodlands project and see the event posters! The Woodlands Project is a youth-led community arts project exploring the evolving and complex relationship between our natural and urban worlds. 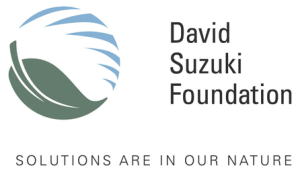 In partnership with the Town of Gibsons, the David Suzuki Foundation and Emily Carr University of Art and Design, The Woodlands Project will focus primarily on a small, forested area that passes through the middle of Gibsons—a seaside village on the Sunshine Coast of BC. While this forested area plays a key role in the town’s municipal infrastructure, the wider community recognizes it primarily for its recreational use and valuable real estate. Led by a core group of emerging artists between the ages of 15 and 25 and with the support of the project’s elementary school-age participants, a team of professional artists, Art Farm staff, David Suzuki Foundation scientists, Emily Carr students and the wider community, The Woodlands Project will produce and present a series of visual, multi-media and/or theatrical installations that explore the town’s evolving and complex relationship to this semi-wild patch of land. The Woodlands Project builds on the successful engagement of elementary-age participants in The Art Farm’s 2014 Aquifer Project by shifting its focus to emerging artists, who will form the creative backbone of the artistic exploration. Courtney Lamb, RJ Lavery , Shanon Fitzgerald , Nick Biden , Chloe Langmaid, Westerly Henry, Dominique Sanchez, Liam Parry, Joanna Strzelecki, Sayata Gabriel, and Sara McDonnell. Sandy Buck, Jennifer Lyons, Steve Wright, Bronwen Payerle, Miyuki Shinkai, and Dean Schutz. In March 2015, The Art Farm facilitated a three day Spring Break Camp. During the process, the participants made a mind map, miniature infrastructure, and creative projects. In June 2015, the project grew into a youth led and driven community building initiative. Twelve emerging artists planned and facilitated a weeklong summer art camp for budding artists ages 8-14 onsite at The Art Farm. 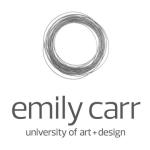 The emerging artists went on to facilitate a community engagement opportunity and build and an interactive installation in August at the 2015 Synchronicity Festival. 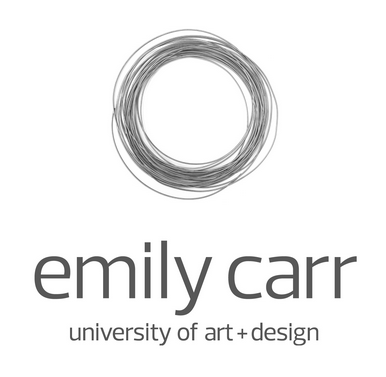 Going forward, the emerging and professional artist will work together to create five installations in the forest or town of Gibsons, BC. Each professional artist has chosen their medium and will choose a ‘Piece of a Forest’ as their starting point. Combining the research provided by the David Suzuki Foundation along with the possibilities that emerge from idea-sharing between ECUAD and Woodlands emerging artists, “Pieces of a Forest” will be presented to the wider community in Gibsons, and Vancouver in early December. Thanks to our Project Partners!